WASHINGTON COUNTY — A 20-year-old man was flown to the hospital with injuries Saturday morning after he became pinned under his Jeep when it rolled on Interstate 15. 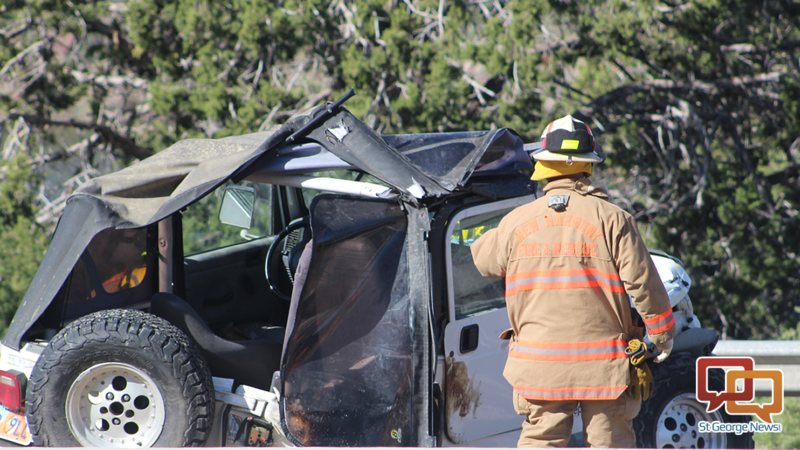 The man, from northern Utah currently attending classes in Cedar City, was driving alone in his Jeep southbound on Interstate 15 between the Kolob Canyon and Ranch exits around 9:40 a.m. when he apparently lost control and the Jeep rolled, Utah Highway Patrol Trooper Lars Gardner said, pinning him beneath its roll bar. Firefighters were able to extricate the man and he was transported to Dixie Regional Medical Center in St. George by Intermountain Life Flight. The man had not been wearing a seat belt, the trooper said, adding a reminder for motorists to always wear seat belts and be careful, especially on busy weekends like this Easter weekend. It appeared the man had been traveling at freeway speed, Gardner said, and he was unsure about any possible distractions that may have factored into the incident. Investigation will follow to figure out exactly what happened, he said. Traffic was stopped for over an hour on southbound I-15, backing up over 3 miles at times. Traffic started clearing at about 10:35 a.m. I got extended family who doesn’t use seat belts and are almost to the point of being “anti-seat belt”. Anyone with even very rudimentary knowledge of the physics involved in a crash would likely get it. Maybe they need to be shown some of those gory crash scene clips where no belt was used. Looking at the not so bad condition of the jeep, had a belt been used this is likely a crash the driver could’ve walked away from. Maybe others can learn from this, who knows. What no seat belt, driving too fast… Not much protection in a jeep.. Maybe he,lol learn to wer the belt next time ..